You know that panicked feeling you get when your mobile device isn't immediately nearby? Yeah, this post isn't going to help that at all. It will, however, give you a handful of useful business apps to further extend that digital Swiss Army knife of yours. Some of these mobile apps are old favorites, and some are more new. All of them were built to make your work schedule easier and your end-goals more attainable. So ... let's get started, shall we? Here are eight notable apps to help your day and business run better. Let's start this list off with a brand new mobile app. 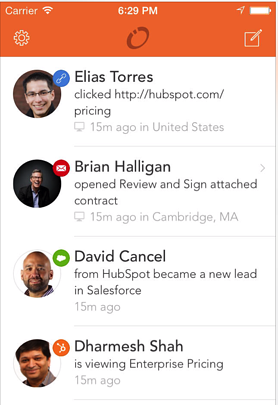 The HubSpot Sales app notifies you when a contact has opened an email you've sent their way. "I've been a desktop user for awhile, and was pleased to see it translate to neatly to mobile. It's really well designed, minimal fuss interface that does exactly what it sets out to do - show you who's read your emails. syncs seamlessly with Gmail and apple mail accounts. You don't even know it's there until you need it"
Likely on many of your mobile devices already, the LinkedIn app is well-regarded for a reason. The app was redesigned in spring 2013 to be cleaner and simpler and make it easier to find what you need. The app seems built for people who consume information on the run. It enables you to quickly scroll a newsfeed of updates without ever being too far from main functionality like updating your profile, saving job listings, and seeing who has viewed your page. "Great mobile version of the site. Well implemented mobile version of the web site. Helps you keep up with your business network contacts while on the go." Lower-scoring reviews mentioned privacy concerns, functionality missing from desktop version, and bugs. Related: Twitter and Facebook Apps for iPhone and Android. Twitter was made for mobile devices -- after 140 characters, your thumbs start to wear out (unless you're a teenager, in which case you can mostly likely write SMS novels by now). Neither Facebook nor Twitter have reviews as strong as LinkedIn for their latest versions, but new versions come out all the time with improvements. As it turns out, meetings come with a lot of baggage. More often than not, there are related emails and documents to reference, directions and names to remember, and even access codes to log in. 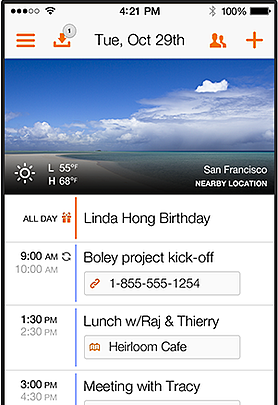 Calling itself a "smart calendar," Tempo aims to organize all of that for you. It goes a step beyond your standard mobile calendar to incorporate webinar dial-ins, your email inbox, LinkedIn contacts, and GPS directions. The goal is to pull in all the information you need into one screen that you can quickly access in the hallway with one hand on your phone and the other on that triple grande latte you love so much. "Intuitive setup, attractive design, feature-rich, but not bloated with useless add-ons. Well-done app that will be a great complement to the standard calendar." Lower-scoring reviews mentioned syncing bugs and additional functionality requests. There was a time before webinars ... I think. It's tough to recall now -- the memory grows foggier every day. 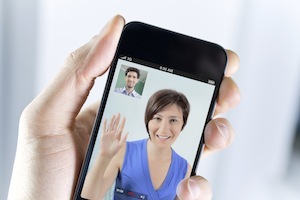 By now, most B2B companies have started to use some form of remote meeting software, whether for webinars, sales demos, or standard run-of-the-mill meetings. Dialing into one of these meeting using your smartphone alone can be a bit of a pain. That's why the mobile apps from Join.me, GoToMeeting, WebEx, and others are pretty critical. What you use will depend on the software your company has gone with. If you don't currently use remote-meeting software, Join.me is a good (and low-cost) start. "I found this app to work well right out of the box. Responsive, steady, affordable." Lower-scoring reviews for both apps focused on feature requests and some audio issues. It's no wonder that we love our own apps for B2B marketing, but since so many of our readers are inbound marketers and HubSpot customers, this app was well worth the list. 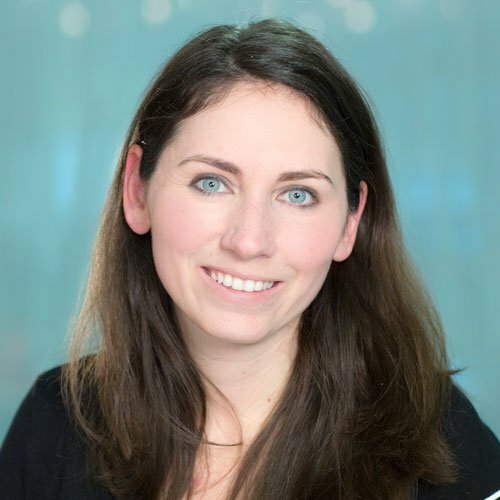 The HubSpot App first launched in 2012, with on-the-go analytics and a built-in Marketing Grader. The capability of this app has vastly expanded since then. If you're not a HubSpot user, you can still download the app for the free Marketing Grader tool. "I'm a marketing Junkie. I can't stand to be without my info. This app lets me check my new leads, my visitor and contact progress, and handle my social media all in one spot. Love that it keeps updating based on our input." If you've perfected the art of pulling your laptop out of your briefcase and taking off your shoes in one swift movement, this app is for you. Designed for business travelers, TripIt gleans any travel information (flight confirmations, rental car receipts, hotel details etc.) from the tangled wasteland of your email inbox and presents it in a neat and orderly calendar view. Now all you have to worry about is whether your flight will have Wi-Fi. "Wonderful tool!!!! 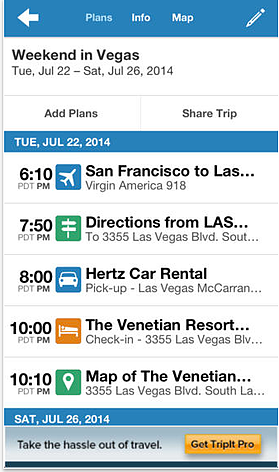 It collects itinerary info for any travel info that comes to the email account, including friends and family. No more searching emails for arrival times and flight numbers when picking up at the airport. Very slick!" Lower-scoring reviews mentioned some bugginess. 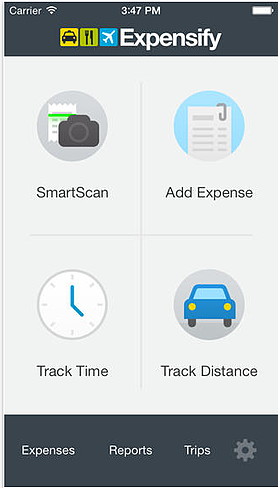 Rated as the "Best Business Travel App" by Business Insider, Expensify aims to make capturing receipts and tracking mileage and other expenses for business much easier. Use your phone to take a picture of your receipts and complete expense forms. A built-in GPS will help you track mileage expenses and integrations with ADP, Salesforce, QuickBooks, Evernote, Excel, and Dropbox extend the functionality. "Intuitive and easy to use Great app. Didn't take much time to learn and quickly add my expenses and generate reports. Love the fact that I can switch between my phone and my computer to work on a report. Integration with my bank account saves a lot of time not having to enter everything. Recommend it to anyone who needs on the go expense reporting." Lower-scoring reviews mentioned some missing functionality from the latest version and some app crashes upon launch. Perch is a new app, but pretty promising for those having to communicate with remote coworkers or clients. In its own words, "Perch is an ambient video communications app designed to bridge the culture gap and improve collaboration amongst distributed teams. Install Perch on two different iOS devices (iPhone 4s an above) to create an always-on video window between two spaces." It's like the Jetsons meets your weekly status meeting. "I love this app, super cool and smart, why has nobody before thought of using face recognition to start video chat automatically." Lower-scoring reviews mentioned a desire to have this work with other versions of the iPhone. Each month brings new apps and new versions of existing apps, so undoubtedly, the list doesn't end here. Add to this list content consumption apps like Evernote and Pocket or event apps like Eventbrite and your phone or tablet's dance-card will quickly fill up. The best approach? Think about your biggest business needs on the run -- do they center on productivity, reading, social networking, or something else? Then find the apps that will make those activities run a little (or a lot) more smoothly. What are some of the must-have business apps you really want? Share your wish list below!